As a part of our ongoing initiatives to help local charities, Sanctuary Marketing Group has developed a website and logo identity for The Kaderly Foundation. 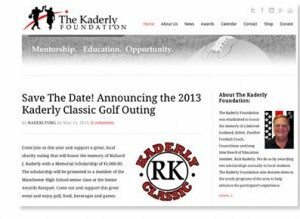 The Kaderly Foundation was established to honor the memory of a beloved husband, father, Manchester High School Football Coach, Councilman and long time Board of Education member, Rick Kaderly. The foundation currently awards two scholarships annually to local Ohio students. The Kaderly Foundation also donates items to the youth programs of the area to help enhance the participant’s experience. Both Kelly Brown and Chris Auman (CEO and President of SMG) attended Manchester High School and graduated in 1989. Although they were not actively involved with youth sports (they were involved with band and activities related to the arts) they believe that youth sports plays a very important role in the lives of our youth and the Kaderly Foundation and Mr. Kaderly specifically deserve our praise and support for their past and current efforts. ← The mobile website vs. app debate – What’s the best choice?